Once upon a time… WAIT, okay we won’t start this story that way, but it did begin at the home of a certain mouse (where I met my wife) and where recently one of my dreams came true. 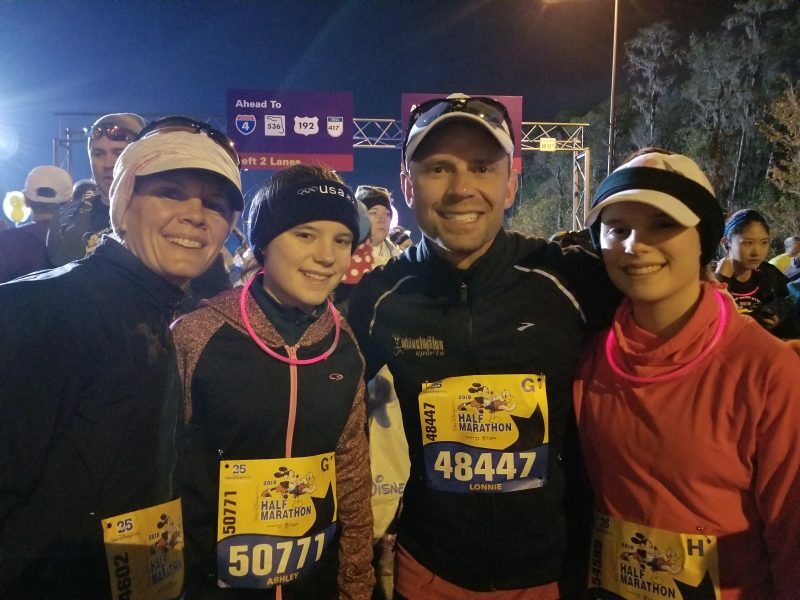 I’ll skip the “once upon a time” start and move right into my dream come true – when my wife and I ran with my daughters in their first half marathon at Disney World. When we nearly lost them, all I could think about was what I would miss out on, such as that first smile, word, step, day at school and running with them in a half or full marathon. This story is about the day that particular dream came true. This blog though is also about what life lessons running keeps teaching me and now, hopefully my daughters. 1. Mom and Dad will always be by your side – During the journey of training and race day (keep in mind, running is not something my girls like to do most of the time), there were many ups and downs. Through it all, we were always by their side to encourage them, push them when needed, be there for them, listen to them, and love them no matter what. As parents, this is what we do and should do. 2. The first step towards a goal is the scariest – For my daughters, waiting for the start wasn’t filled with excitement, but with nervousness, stress, a few tears, and even a few moments when they wanted to back out. In life though, we all are in those spots in various circumstances. The scariest part can be finding the courage to take that first step toward reaching your goal. 3. There will be ups and downs – Just as with life, our half marathon run had times when it was hard and times when it would have been easier to stop, but the girls kept going. In life, there are times when we may deviate from our goals, or have setbacks or delays, but we can get on course again and it is important to keep focusing on the goal. 4. Be Kind – Sometimes people can be rude, mean, and entitled, but one thing I witnessed from both my girls was an amazing sense of kindness. No matter how hard or how easy parts were, they always waved at every spectator, high-fived anyone who was willing, and had a smile for their fellow athletes. What an amazing thing for me to witness! Often when I run, I am focused on just my goal, and forget to take in and show kindness and encouragement to those around me. Seeing the girls display this and take in the full race experience, could not have made me more proud. It made me remember how important it is to be kind and to be present in everything we do (vs. in the clock of our social media worlds). 5. You are stronger than you think – Along the way, despite the fact that we didn’t have the best training we could have had, I knew how strong the girls really were. It was my wife’s and my job to help them find that inner strength and give them confidence that they were stronger than they realized. One of my daughters had terrible stomach pains for almost all of the run, yet despite several doubts of finishing, she kept pressing on and found her inner strength. 6. When you see the finish, go for it and celebrate – After a few challenging miles, we re-entered one of the parks, just a mile from the finish. I was amazed to see the transformation as the girls began the celebration the smiles, the high fives, and then, with the finish line in sight, the sprint. Arms held high, smiling from ear to ear, each of my daughters proudly received a shiny medal to commemorate their accomplishment. At that moment, they realized they had achieved their goal – they were Half Marathon Finishers!!! We need to remember to take time for this as we achieve goals in life. Be proud, celebrate and celebrate the success of those with you on the journey. During these celebrations, realize that the finish is not end, it is the beginning of what is possible. Our experience running the Walt Disney World Half Marathon taught all of us some very valuable lessons about life. I could not be more proud of my girls. My dream and theirs came true and I hope it is just one of the many dreams they work hard to achieve. The Great Candy Run, which came about as a way to support families diagnosed with fetal conditions (our twins!) and is the ideal first race for kids. Check it out!